Melt butter in a large heavy-bottomed pan over medium heat. Add the onion and sauté for 2-3 minutes. Add the leeks to the onions and sauté for another 10 minutes. Add the garlic to the leek mixture and sauté for another 4-5 minutes. Season with salt and pepper to taste. Remove mixture from pan and set aside. In a medium bowl, mix together the mushrooms, olive oil, and salt. Place mixture on a baking sheet and roast in the preheated oven for 15-20 minutes, stirring occasionally, until lightly browned and cooked through. Keep warm. 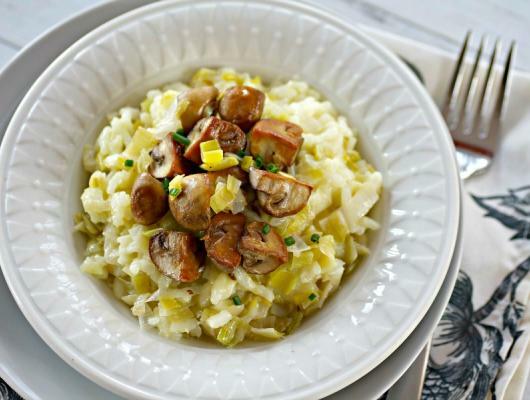 While the mushrooms are roasting, prepare the risotto. Heat the broth in a medium saucepan over medium-low heat and keep hot. In the same large pan that the leek mixture was cooked in, melt 2 Tb butter over medium heat. Add the Arborio rice and cook, stirring consistently, for about 1 minute, making sure rice is coated with the butter. Add the wine and stir constantly until the wine has fully absorbed into the rice, about 1-2 minutes. Add the hot broth, 1 cup at a time, to the rice and stir constantly until the broth is almost fully absorbed into the rice. Continue to add the broth until the rice is tender and mixture is creamy, about 20-25 minutes. Add more broth for a creamier texture. Rice should be slightly al dente (firm to the bite) and not mushy. Stir in the Gouda cheese, the remaining 1 Tb butter, and the leek mixture. 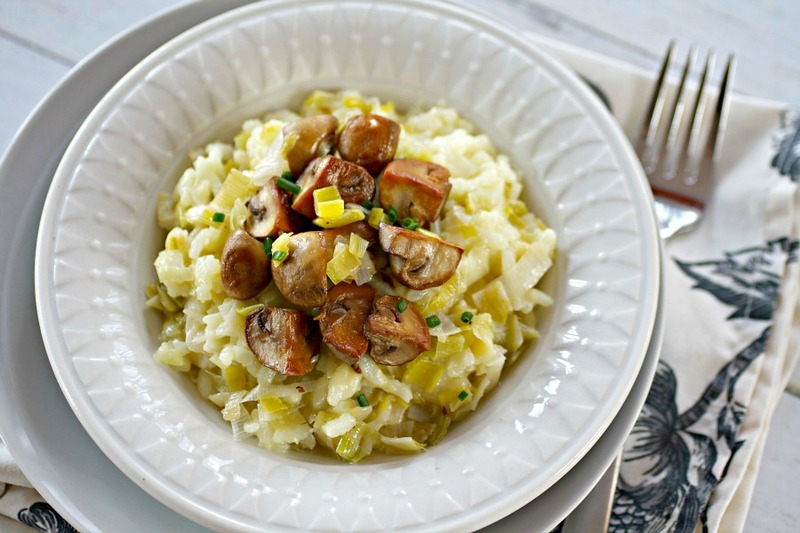 Transfer risotto to a large serving bowl and top with the roasted mushrooms.